The boxes are prepped, primed and painted with flat enamel. Then the design and text outlines are screen printed, also with enamel. The rest is hand painted with, you guessed, enamel…. It’s time consuming, however I enjoy it and most players seem to really dig the unique look. I’m glad you like it. The Sparrow I sent you uses some really nice metallic colors that look great with a heavy application. Hopefully the sound will meet or exceed your impression of the art! 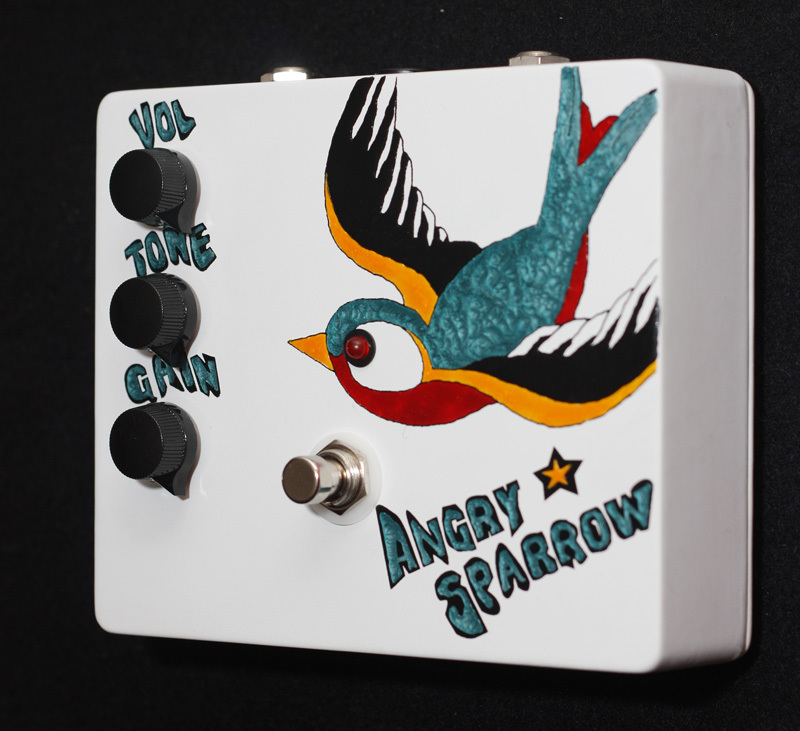 Unlike other fuzz effects that have several stages of transistors with clipping diodes cascaded into one another, the Angry Sparrow Tone Box has only one clipping stage. The result is a more musical fuzz tone that is versatile and dynamic. The Deluxe version has a three band passive tone-stack for greater tone shaping. The controls are pretty self-explanatory, however here are some tips for getting the most out of the device. This controls the overall output volume of your Angry Sparrow. Be aware, this device is capable of a very large volume boost to your signal. Make sure not to overload other effects or your amplifier! This is a passive low-pass tone control. Very similar to what is on your guitar/bass. Most of the time you will leave it wide open (full clockwise), just like most players do with their tone control on their instrument. However, it can be very useful to tame the highs on a very bright amp, or if you want a darker tone at higher gain settings. The Angry Sparrow Deluxe’s tone-stack is a three band passive EQ that is interactive. In order to get the results you want, keep in mind that the controls only subtract from the signal. The tone-stack is basically removed from the circuit with all controls at full clockwise. Also, the Middle control will assume more of the high and low frequencies as you reduce the Treble and Bass controls. Decide which frequencies you want more to add, and reduce the other controls. Much time and effort was put into exactly how the gain control functions. At the lowest (counter-clockwise) settings, there will be very little change from your original sound, only a little compression and a warming of the tone. You can set the volume higher and use the pedal as a warm-boost. As you increase the gain, you will find dozens of musical overdrive/distortion/fuzz tones that work with more complicated chords and harmonies than you would expect from a circuit of this type. To put this guy through the paces, I enlisted the help of Jimmy Rolle. He’s playing his Gibson Les Paul Custom Shop Elegant into a Rivera Knucklehead 100w head through a Marshall 4×12 cabinet loaded with Celestion Vintage 30s. Nothing between the guitar and the amp except for the Angry Sparrow. The audio was captured with a Shure SM57 and Fathead Ribbon Mics. For this demo, Jimmy is playing various stages of the amp. It starts off on his clean side, then to the gain channel and finally the same gain channel with the boost of the amp enabled. You can really hear how the pedal responds through these changes. After playing the Angry Sparrow, Jimmy and I talked about our general impression of the pedal. Here are some of the points that came up. You can really get some great vintage musical fuzz tones. It is a really usable fuzz! It’s a very ‘smooth’ and versatile fuzz with lots of control. With the tone knob you can get some good mids to cut through. It doesn’t just boost the highs, which gives it a nice classic fuzz midrange. The low end is very fat, but again, usable… which is great for fuzz. If your amp has headroom in the preamp stage, this pedal will boost big time. The pedal is simple. I love simple pedals. 3 knobs and a dream.. that’s all you need! As you can see/hear this is a great sounding fuzz. You can contact Flickinger Tone Boxes and order one for yourself. The Standard Angry Sparrow runs $200, while the deluxe goes for $225. The deluxe has a 3 band passive tone stack. Be sure to check out Flickinger Tone Boxes on line to see their other pedals! They have some good, good stuff!